Your first paranormal book, Wolf Medicine, was about shapeshifters and an American Indian legend. Where did the idea for your Demon of Annwn, filled with Ancient Celtic and Egyptian ritual magic, come from? Anticipating the economy and jobs market, my husband and I moved to the rural property we had purchased for our future retirement. We are off-grid and after Thanksgiving there is no easy way in or out without hiking 2+ miles in the snow and ice (sometimes hip deep). I spent a lot of time reading anything I could get my hands on for entertainment. When my husband was laid off the following January, I told him we should start writing "that book we keep talking about." Then we started throwing together ideas. Our initial goal was to have (as close as we could) a book based on historical fact, ancient legends and lore, while incorporating actual magical practices. The book we always wanted to read - fiction with working magics. In addition we had always wanted to write a novel that would explore the possibility of what would have happened if an actual group or family who practiced the ancient ways had in fact survived the Witchcraft persecutions of early New England. We want to examine how they survived and what they might be like today. This book helps to follow that thread. While the book was unfolding, many times going off in its own direction despite the outline, we were careful to ensure that our ideas had some basis in fact or history. There is very little in the book that is purely fantasy. We'd get ideas about things and then, when we could get in town and on the internet, research them. Usually we would find supporting documentation on line or in our personal library. Wolf Medicine was our first book in print. We had finished writing the Demon of Annwn and then, while searching for an agent, we wrote Wolf Medicine. There are two more of 'Ruty's Shorties' that we are working on. The short books were initially to give readers a taste of our writing style and imagination and offered these as free ebooks until the next one was released. You seamlessly weaved both Celtic and Egyptian rituals together in the book. What made you choose these two to combine? Of course this would be my husband's long love for Egyptian philosophy and that we both have a strong affiliation for Celtic lore, legend and practice. It is one of the practices that create a natural and strong connection between us, the Earth and the Gods. This is especially so living so remotely in the New Hampshire Mountains. The ability to practice the Arts out in nature, as well as just living here, seems to have heightened our awareness. My husband also had an affinity to the name 'Arianrhod.' He initially started the drafts of the first few chapters and named the heroine. The rituals, tools and practices used are very similar in design and purpose between the Egyptian and Celtic traditions. Tying the legend and lore together seemed almost too easy at times. We'd have a thought or dream about the plot or twist and sure enough there was enough basis in fact to support it. At night (it comes around 4:30pm in the winter) we'd be sitting in our little cabin with an oil lamp for light, writing on our pads in pencil for hours on end, then we'd open our laptops and type a battery's worth of story before firing up the generator to charge the computers, finish transcribing and printing drafts. At times it seemed as if the book wanted to tell its own story. It was also very important to us that our fictional family have a truly workable magical system, with authentic legends and practices. We wanted the story to also evoke the question, 'What if this were true? Could this family and their practices really exist?' We hope the readers think so. In fact many of the magical techniques described mirror those we practice. Crom-Cruach's Egyptian appearance as Apep seemed to fall right into place. As cultures merge, grow and change, many of the Gods, Goddesses, demons and faery's take new names, places or merge with other local favorites. Some do fall by the wayside unfortunately. But in this case the pieces seemed to fit well with legend, history and the magical practices. How did you choose to use Crom-Cruach as the demon for your story? We love books. When we were first dating we used to take day trips all over the New England area and we shopped at every used bookstore we could find. I even have an old journal with the business cards, newspaper ads, notes, and maps of the places we visited. That journal was a large part of the places we had mentioned in the book. During one of these trips we picked up Jim Fitzpatrick's, 'The Book of Conquests.' This describes the early Celtic legend of the arrival of the Tuatha de Danann to the shores of Ireland and the First Battle of Moy Tura. His marvelous book with illustrations and rich storytelling, in which Crom-Cruach plays a key role, was on hand most of the time. The legend tells that Crom-Cruach was called up by the Fir Bolg Druids to defeat the Tuatha in the fight for the land now known as Ireland. Evidently the Fir Bolg's (although related to the Tuatha) got their first and they weren't going to give their claim up easily. Crom-Cruach was defeated by the Tuatha de Danann. That defeat would be something that Crom-Cruach would still be thinking about and he was perfect for calling upon. Being summoned and coming upon the Danann's bloodline - how perfect! One of our 'must-have' items in the book was a shapeshifter. We spend many hours and days discussing how this could truly work. In 'Wolf Medicine,' because it was supposed to be a short story, the metamorphis was purely fantasy. In the 'Demon of Annwn' we drew on actual occult theory to explain how this change would take place. Change on the astral affects the material. Crom-Cruach was already a master on the astral and had experiences on the material. Peter's willingness to let his astral self be used by Crom-Cruach was as true to reality as we could get. His naiveté at the consequences and preventative measures gave the demon free reign on obtaining control over Peter's actions, thoughts and form. We had other books and sources, but Fitzpatrick's was truly an inspiration. Out of the thousands of books we still have in storage, this book was at our cabin during the writing. Why I have no idea. I hadn't seen the book in years. Like I said, the 'Demon of Annwn' seemed to take a life of its own with information, resources and ideas popping out of the blue. There are quite a few interesting characters in The Demon of Annwn. Which was your favorite to write about? Wow. This is a really tough question. We both took turns writing character parts, plots and the magic. Each character gave us a different emotion when we were writing for them. We had to develop who they were, where they came from, what families they belonged to, what their 'specialties' were, their function in the book and the series, what they looked like, where they lived. That was fun, frustrating and emotional. The process of development invested us deeply with each character we created. We both wanted the women to be tough and strong. Strong women also need strong men. Arianrhod does react without thinking at times, but she's young and we both wanted to see her grow through the book and the series to come. We feel this character has enormous potential as the series progresses. Perhaps the best answer to this is the town and community of Whitewood, NH. Although all the characters were fun, evoked joy, sadness and instigated a few heated arguments between my husband and myself, Whitewood was the community and town that we created taking all our favorite elements from surrounding towns here in New England to make a village of our dreams. Naturally our dream village would have dream neighbors! The Demon of Annwn ended with open questions and several possible directions for the series to go. What are your plans for the series? We planned for the series before it started. The books would be designed to stand-alone, so if someone picked up a book in the middle of the series they wouldn't be lost or confused. Many ideas were initially outlined for the future books and decided how the series would take shape. The next two books are fully outlined and writing has begun on the second book in the series at this time. Although Arianrhod is the Banriona and will appear throughout the series, we hope to focus on other characters and keep the story fresh and growing. Even the shorts will have some elements (if not directly related) to the main series. We love Whitewood! There is also the ongoing theme of reclaiming the lost knowledge and teachings of the ancient world. That will be fun as there are so many roads to follow in this endeavor. Additionally there is a deeper thread that is running through the series. In each book we plan to tease a little out. Part of this was briefly touched upon in the Demon of Annwn but never fully discussed. Hopefully the Gods will be pleased. The smaller characters were interesting and we wanted to develop them more. Some of them will show up in other books. We even briefly mention the female reporter, Michelle Gavin, in Wolf Medicine. She was supposed to have a bigger role in this book, but we had to cut back as the book was getting out of hand in size. However, most of the characters have an active place in the ongoing story. We really had a lot of fun planning and writing this book. It wasn't all fun and games. There was a lot of hard work, arguments and rewrites. In the end we were very pleased with the result - even reading it for the hundred-and-umpteenth time. We hope the readers enjoy it as much as we did and we do love the reader's feedback – good or bad! Both of us have been dying to dedicate blocks of time to the other writings in the works, but life (getting ready for the long winter) is slowing us down a bit. Once the snow falls, we'll be huddled up in our little cabin spinning more tales about Whitewood and the residents. 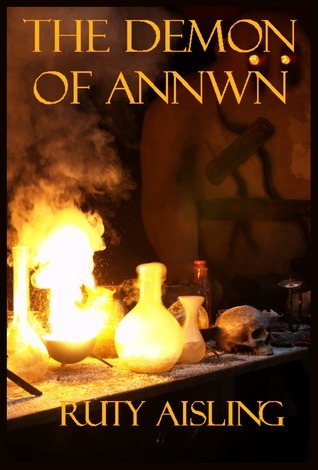 Ruty Aisling will be giving away a copy of her The Demon of Annwn eBook to at least three (3) lucky winners. This is an International giveaway. To enter, leave a comment along with your email address so we can contact you if you win. Good luck, everyone! By the way, your secluded, snowed-in, cabin in the woods sounds cozy & peaceful. I'm jealous! Good luck with your future writing!!! Is a new author to me. I would love a chance to win this book. I like finding new authors to check out. This bok sounds really good and would love to win a copy. Thanks for the chance. thanks for the interview. i enjoyed it. the book looks good. Thanks everyone! I hope you enjoy it. And thank you again to the ladies of BBPR! They are doing a superb job! The book sounds very good and very well researched! I would love to read it (and the others... I need to go get them!) Thanks for the giveaway! This looks like a good read. Thanks for the interview and giveaway! Sounds like an awesome book!! Thanks for the contest!!!! I love Egypt-anything! Sounds like it would be a very unique and interesting book! Please enter me in the draw, and thanks for the giveaway!